Money Matters and So Do Your Dreams: Don't Wait - Just Start! What things are you putting off that need your attention? I am talking about the things you may procrastinate about that shouldn't wait. You may be telling yourself, “I’ll get it done when I have more time, more money, or when I get that new job”. But are we being honest with ourselves? What’s stopping us from attending to the things we should? Napoleon Hill, renowned author of the book, Think and Grow Rich, said, “Do not wait; the time will never be ‘just right.’ Start where you stand and work with whatever tools you may have at your command and better tools will be found as you go along.” Now this may seem a little strange. Last week, I told you to “wait for it”; and now this week, I’m telling you the exact opposite. Don’t wait – don’t procrastinate. Just start. I’m talking about things that cause anxiety, fear, and insecurity to build. When it comes to money matters, everyone’s priority is different. You may have good intentions to start saving for your children’s education, your retirement, or to pay down debt yet you never do. I feel part of my role as a financial planner is to motivate you to take action. I will do what it takes to inspire, educate, and provide resources to help you. The only thing I can’t do is MAKE you do something you don’t want to do. But I will do what I can to help you understand “why” action is important. Are you ready? 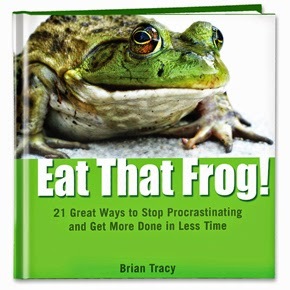 Start by listening to what Brian Tracy, author of the book, Eat That Frog, has to say about “Procrastination.” When this video was shared with clients, they immediately recognized the important things they had put off. Their wills haven’t been updated; their insurance coverage was inadequate; and they didn’t have any savings for emergencies. Take control. Simply take the next “right” step for you. What are all the things you haven’t done that need your attention? Click here for a list of ten financial items every Canadian should have. Review the list, prioritize the items which need your attention and set deadlines when you expect to complete each task. One day you will be glad you did.